California’s Salton Sea is a fertile oasis in the hostile desert of south-eastern California. It has been adopted by millions of birds migrating along the Pacific Flyway and also attracts human anglers and boaters. Rehabilitating the Salton Sea presents a huge challenge to the local, state, and federal officials that share responsibility for its health, as well as the health of those in surrounding communities. 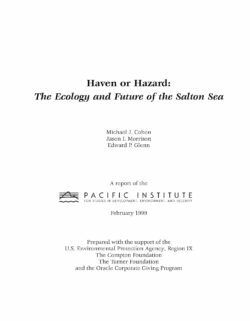 Originally published in February 1999, Haven or Hazard: The Ecology and Future of the Salton Sea looks in detail at the condition of the Sea, the threats to the area, and possible solutions to protect its value for animals and people. Between 2013 and 2015, a large part of the western United States, including the Central Valley of California, sustained an extreme drought. The Central Valley is recognized as a region of hemispheric importance for waterbirds, which use flooded agriculture and wetlands as habitat. Thus, the impact of drought on the distribution of surface water needed to be assessed to understand the effects on waterbird habitat availability. Methods: We used remote sensing data to quantify the impact of the recent extreme drought on the timing and extent of waterbird habitat during the non-breeding season (July–May) by examining open water in agriculture (rice, corn, and other crops) and managed wetlands across the Central Valley. We assessed the influence of habitat incentive programs, particularly The Nature Conservancy’s BirdReturns and The Natural Resources Conservation Service’s Waterbird Habitat Enhancement Program (WHEP), at offsetting habitat loss related to drought. Results: Overall, we found statistically significant declines in open water in post-harvest agriculture (45–80% declines) and in managed wetlands (39–60% declines) during the 2013–2015 drought compared to non-drought years during the period of 2000–2011. Crops associated with the San Joaquin Basin, specifically corn, as well as wetlands in that part of the Central Valley exhibited larger reductions in open water than rice and wetlands in the Sacramento Valley. Semi-permanent wetlands on protected lands had significantly lower (39–49%) open water in the drought years than those on non-protected lands while seasonal wetlands on protected lands had higher amounts of open water. A large fraction of the daily open water in rice during certain times of the year, particularly in the fall for BirdReturns (61%) and the winter for WHEP (100%), may have been provided through incentive programs which underscores the contribution of these programs. However, further assessment is needed to know how much the incentive programs directly offset the impact of drought in post-harvest rice by influencing water management or simply supplemented funding for activities that might have been done regardless. 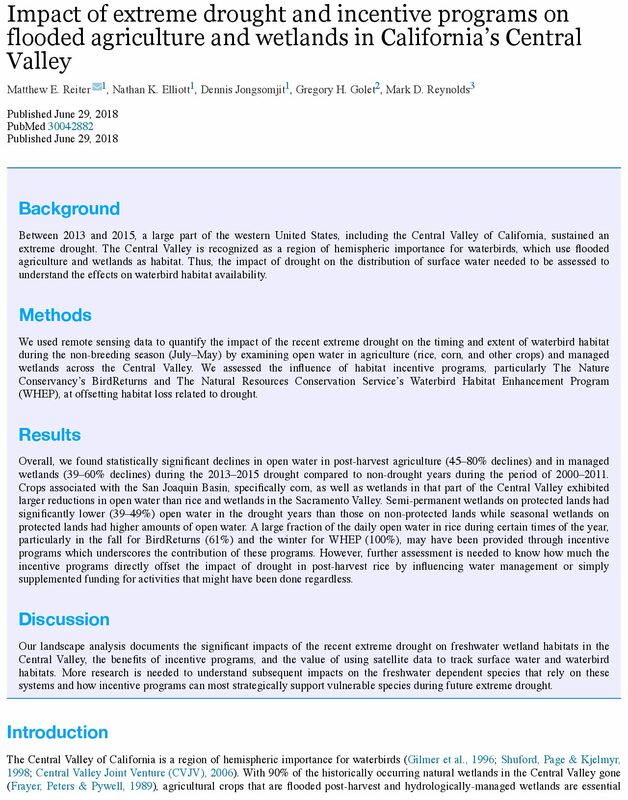 Discussion: Our landscape analysis documents the significant impacts of the recent extreme drought on freshwater wetland habitats in the Central Valley, the benefits of incentive programs, and the value of using satellite data to track surface water and waterbird habitats. More research is needed to understand subsequent impacts on the freshwater dependent species that rely on these systems and how incentive programs can most strategically support vulnerable species during future extreme drought. 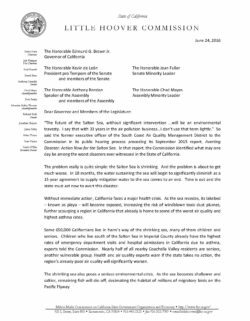 The Little Hoover Commission in a letter sent Friday to Governor Brown and the Legislature again renewed its call for urgent action at the Salton Sea to prevent a massive public health, environmental and economic disaster in Southern California. Policymakers must replicate the effective approach taken to meet the state’s rewewable energy goals, wrote the Commission in its letter. Then, the Govenor gave a senior official the authority to do what it took to get projects through red tape at all levels of government. The model was remarkably simple: Get everyone together and get it done. The letter results from continuing oversight to which the Commission pledged in its 2015 report, Averting Disaster: Action Now for the Salton Sea. The Commission held an April 2016 hearing to get an update on the state’s progress in strategically managing the Salton Sea. It heard from the assistant secretary for Salton Sea policy at the Natural Resources Agency, as well as stakeholders from local government and the environmental community. The Commission’s letter acknowledges that momentum is building and that the state has made important progress in managing the sea, particularly with $80 million in funding in the Governor’s proposed 2016-17 budget. However, the Commission’s letter maintains that the state is not moving fast enough or allocating sufficient resources to prevent a disaster. Timelines have been delayed, short-term goals scarcely cover a fraction of exposed lakebed and much more than $80 million is needed to manage the sea.